The Surrey Hills Heritage Collection is a significant collection, which includes, documents, memorabilia, advertisements and ephemera relating to the history of Surrey Hills and Mont Albert. Concerned individuals began collecting material during the 1970s and from the time the Neighbourhood Centre was opened, there was a ‘History Nook’. The Centre has supported the collection ever since. It owes much to the efforts of many individuals, including Jocelyn and Ken Hall, Alan Holt, John Reaburn, Jean Boucher and Daphne Wisewold, and to the generosity of many in the community who have donated photos and other information to it. There are over 2000 photos in the collection including many of early residents, sporting teams, shopkeepers and local primary school grades. The collection is not static; some of the photos are relatively recent and document for the future some of the many changes in the built environment of our suburb over recent decades. During 2007, photos in the collection were scanned, so the collection now contains digital images as well as hard copies. This project was facilitated by a grant from the City of Boroondara Community Grants Scheme and additional funds from the Canterbury Surrey Hills Bendigo Bank. The ongoing focus of work on the collection is cataloguing it and making it accessible online through the website of Victorian Collections. Cataloguing the collection is a great way to learn about the history of our area and we are always on the lookout for new volunteers with an interest in history to assist with this project. A very young looking Henry Jamieson outside his shop at 149 Union Road, which in 2015 is the site of Union Tree Thai Café. 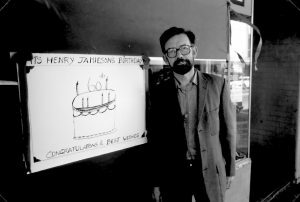 Henry Jamieson was a familiar persona in Union Road and around the Surrey Hills Neighbourhood Centre for decades. Henry lived all his life within 3 kilometres of his radio shop. Son of Catherine and ‘Mick’ Jamieson, Henry was born in 1927 in View Street and was educated at Box Hill Grammar School. His father died when he was young and Henry took a job as a technical assistant with the Commonwealth Film Unit. Film was a life-long interest and he became a longstanding member of CATHS (Cinema and Theatre Historical Society of Victoria). Henry also had a profound love of music – reflected in his work and hobbies. He joined Adrian Knowles, who had started his radio shop at 149 Union Road in the 1940s, and trained at RMIT as a radio tradesman. In time Henry took over the business. When 3MBS established in Kew, Henry was an enthusiastic supporter and volunteer. For some years Henry and a co-producer presented a prime time Saturday evening programme Bach to Bernstein; later his distinctive voice could be heard in the early morning time slot, Daybreak. Henry died in 2011. “As a family we lived behind and above the actual shop, enjoying a large backyard, ideal for playing cricket, from 1927-1942. Arthur ‘Metz’ as he was always known by, is behind the counter, ice-cream cone in hand ready to serve ice-cream. The certificates, behind the jars of sweets, were awarded to him for Professionally Dressed Window Displays when Empire Day was celebrated – [it was] dressed by chocolate manufacturers. I know that Cadbury’s was one. You will also notice an advertisement for Peters ‘Fuzz’, [it was] yellow in colour and a slightly different texture from ice-cream. It was not one of Peters’ success stories but was a favourite for many years. Arthur and Elsie made their own flavoured ice blocks until the advent of the icy pole. A range of flavourings for his well-known spiders and malted milk drinks can be seen in front of the mirror. You will also notice a hot water urn for making tea and coffee, also an advertisement for Guests biscuits – a few tins on the shelf. These were served, using brown china crockery on glass topped tables (out of the picture on left side). Peters Ice-Cream was founded by Frederick Augustus Bolles Peters (1866-1937) and dates back to 1907. 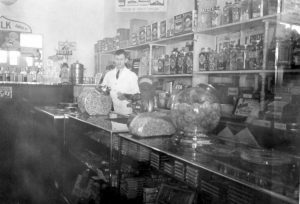 Peters was an American, who initially lost money in Australia, but spurred on by homesickness and craving ice-cream (which was not readily available here), he leased two rooms in an ice factory in Paddington, Sydney and set up Peters’ American Delicacy Co. Ltd on 27 August 1907. He set up a factory in Victoria in 1927. 'Spenceycroft', 654 Canterbury Road, Surrey Hills. For many years, this home was hidden behind a large fence sheltering it from the noise of traffic along Canterbury Road, however it dates back to the very early days of settlement in this area. Canterbury Road was then known as Delany’s Road. ‘Spenceycroft’ is thought to incorporate part of the original farmhouse built on the site by George Klepper, who planted a vineyard in the area. George’s family was one of a number of German families who settled in Surrey Hills during the later part of the 19th century. Later, the land associated with ‘Spenceycroft’ was worked as a dairy farm by James and Elizabeth Rayment. In recent years Spenceycroft was sold several times and became increasingly derelict. Since its last sale, it has been demolished. 44 Guildford Road, Surrey Hills. This Edwardian style home was relatively newly-built when this photo was taken in 1913. Its owner, Mr B Offszanka poses on the veranda and his cart can just be seen on the left of this picture. No 44 is a modest home with simple detail in the picket fence and fretwork and coloured patterned glass in the windows rather than more ornate leadlight. Later the main window to the street was replaced with a bay window, and in more recent years the home has had a second storey added. Phil Voutier was a pupil at Chatham Primary School in Weybridge Street from 1927, the year the school opened, until 1932. He is one of a number of pupils who posed for an enterprising photographer who visited the school with his pony early in 1929. Sue Barnett is the Coordinator of the Surrey Hills Neighbourhood Centre Heritage Collection. Sue is assisted by a small group of dedicated volunteers. New volunteers are very welcome. Access to the collection is possible on Mondays between 10am-3pm and other times by appointment. Direct email: heritage@surreyhillsnc.org.au. donated material to the collection in the past – as we wish to update our records regarding past donations.